Today through October 31, 2017, British Airways is offering a 35% bonus on transfers from hotel programs. This can be best maximized through Marriott Travel Packages. Alternatively, IHG Credit Card Holders who need to top up for a British Airways award might be interested in this promotion as well. Read on. Most of the transfer ratios from hotels are fairly poor and still aren’t attractive even with a 35% bonus. For example, 5K Hyatt points converts to 2,700 Avios with the transfer bonus. While 5K Hyatt points will get you a free night in a Category 1 Hyatt (often worth north of $100), 2700 Avios is not quite halfway to a shorthaul (650 miles or less) 1-way flight at peak prices. However, there are two options that could present a good value with this bonus: Marriott and to a lesser extent IHG. Greg and I have written many times before about the value to be found in Marriott Travel Packages (See: 12 Things you need to know about Marriott Travel Packages). For those new to these packages, they enable you to turn a large chunk of Marriott points into a certificate good for a 7-night hotel stay plus airline miles. These packages are already a strong value — adding in a 35% bonus on the miles makes them work out very well. As a reminder, here’s the chart. The strongest values on the chart are in the far-right column. The top-right corner has a package that costs 270,000 Marriott points and is good for a 7-night stay in a Category 1-5 Marriott and 120K Avios. With the 35% bonus, that means you would get 162,000 Avios. Depending on how you use the Avios, that’s great. Remember that you can transfer Avios from British Airways Avios to Iberia Avios, though here are some hoops through which you need to jump (See: Bet You Didn’t Know: 3 Methods To Transfer Avios Between Iberia and British Airways). 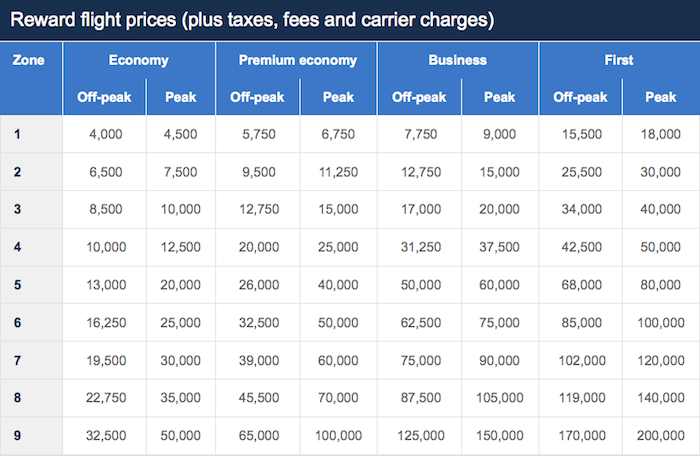 That can be a good value for those in Chicago, New York, and Boston as Iberia charges just 34,000 Avios one-way in business class during off-peak season between those cities and Europe (and they occasionally run specials for even less; see: Business class for 25.5K one way to Europe from several US cities). That 270K Marriott point package could get you enough points for two round trip business class tickets to Europe and 7 nights in a hotel — which is a great use of 270K Marriott points. Even in peak season, at 50K one way in business class it’s still enough points for three one-ways. Of course, thanks to the ability to move points freely between Marriott and Starwood, this means that you could alternatively use 90K Starpoints to book this package. Converting 90K Starpoints to Marriott would yield the 270K needed for the package. If you have a use for the 7-night certificate, it’s a great value. Seven nights in a Category 5 Marriott would normally cost 150K points, so for 120K more Marriott Rewards points you’re getting 162K Avios. I used my 7-night certificate this past February at the JW Marriott Phu Quoc. Our stay there was great — but I knew we wouldn’t be able to stay for 7 nights when I made the reservation, so we definitely didn’t get “full value” out of it in terms of that. Truth be told, I never expected to get 7 nights out of my certificate as I can’t remember the last time we stayed in one place for 7 straight days. Converting Starpoints to Avios at a 1:2.16 ratio is a great deal if you have a decent use for the Avios! And if you keep the 7-night certificate (so your net cost remained at 90K Starpoints), that can still be a great deal. That’s not amazing, but it’s not necessarily a bad deal. Over the past six or seven months, we’ve reported on several opportunities to buy IHG points for around half a cent each (See: Can you buy IHG points for .46 cents per point?). If you have built up IHG points at that rate, your net cost for 9,000 IHG points is about $45. That’s like paying about 1.67 cents per point for your Avios — not a rate at which I’d speculatively hoard them, but not a terrible conversion if you’re flush with IHG points. This 35% transfer bonus from hotel points to British Airways Avios is best maximized with Marriott Travel Packages, whether via your Marriott Rewards points or those transferred over from SPG. Whether or not it makes sense to make such a conversion really comes down to your intention for the Avios. I wouldn’t make this conversion without a plan for how to use the Avios, but it can certainly be a good deal for those who will put the Avios to good use. Nick’s an awesome addition to FM. Keep up the good work. Do note the Iberia business class 34,000 redemption is for off peak only. If you want visit Spain or fly into Madrid in the summer months of June, July, August it costs 50,000 Avios one way. Still not a bad redemption however. So for the Marriott package you essentially have to stay 7 nights in the same hotel? No splitting or changing? If I get a lower category but later wish to upgrade to a nicer category hotel, how could I do this? How many people did you hire to compliment you in the comments? I have a hard time to figure out how to use Avios British Airline points. How often does this 35% bonus deal on Avios come around? Is it ever higher? With the 100% bonus buying IHG points right now, is this “really the best deal ever”? I’m trying to decide whether to pull the trigger and max it out. A short haul r/t in the US is 15K points, and that’s ~ $250, using the 1.67 cents/ Avios formula . From Seattle to Helena, that’s a pretty good deal. Not so good where prices are more reasonable than Montana. Does it ever get better than this? I’m getting low on Avios.